These high-rate stock-location rear springs can be matched with either front coil-overs or stock-location front springs to provide a good handling balance and level ride quality after installation of front coil-overs and/or a rear torque-arm suspension system. Is your Mustang equipped with a Torque-arm? To take full advantage of the improved rear suspension geometry of the MM Torque-arm Suspension System, the rear spring rate must be increased. The bind-free MM Torque-arm increases rear grip so much that the rear spring rate needs to be raised in order to increase the rear roll resistance. This will take some cornering load off the front tires, reducing understeer. Does your Mustang have front coil-overs, either with or without a Torque-arm? To achieve the best handling balance with a front coil-over conversion the rear wheel rate must be increased significantly from what is typical for the Mustang 4-link suspension. 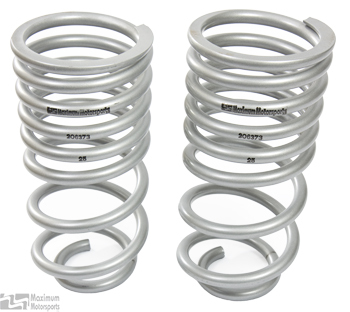 These high-rate springs will improve your Mustang's handling balance with a front coil-over conversion having spring rates of 300-350 lb/in, for the standard Mustang 4-link suspension. If your Mustang has a torque-arm suspension, these high-rate springs will match with front coil-over spring rates of 225-325 lb/in.